Kristen here again, with your hour 21 check-in, door prize winters, and a readathon pet peeve. At this point, I’ve been ‘thon-ing all day. I’m ensconced in my comfort zone, got my laptop going for the behind the scenes action, my book open for every moment of reading I can grab, and usually two snoring dogs surrounding me. You’d think he’d have learned by now. BUT. Now that we’ve broken your silence, TELL US WHAT YOU’RE READING. What’s the most surprising book you read today? The most compelling? The funniest? Saddest? 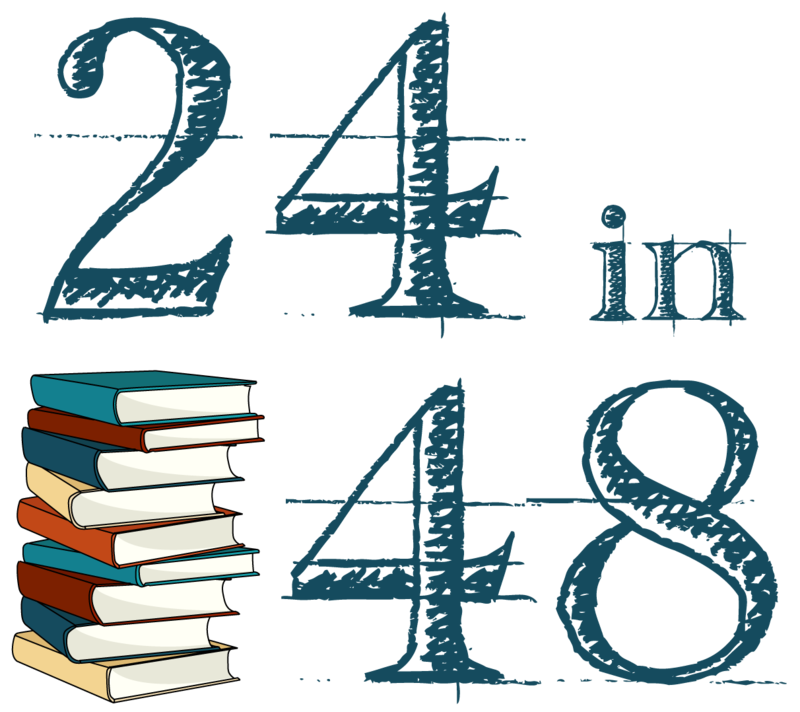 Here at 24in48 HQ, we’re always looking for perfect ‘thon reads (not that our TBRs need any assistance). If you haven’t hydrated recently, go do that! If you haven’t eaten a single veggie, maybe mix some into your snack situation. Stretch, breathe deep, and carry on. You’re. Doing. Great. Go forth and claim your prizes! Currently reading and watching HP 2. Decided I needed some sound to keep me up and engaged. I’m reading A Discovery of Witches. It’s the only book I’ve read today, probably won’t get to book 2 until tomorrow. Haven’t started it yet (it’s in my list! ), but I’m excited to read the book “I wish my teacher knew…” Some student responses can get pretty personal, and it’s something I want to incorporate into my own classroom to show that my students are important and they have a voice. I feel proud I thought ahead this time – I bought a veggie tray to snack on! Hydrating I do need to work on. I made the mistake of starting midway between 2 long books. Time to take a break and read a comic. I have discussion on it tomorrow anyway, so it needs to be done anyway. I’m starting Story of My Life by Jay McInerney, and when I’m not reading that I’m listening to A Court of Mist and Fury. Man, how long is the ACOWAR audio? That’s got to be close to 20 hours! I’m only in book two so I haven’t gotten that far into my stack. I’m enjoying Working Stiff: Two Years, 262 bodies, and the Making of a Medical Examiner. I interned in a Medical Examiner office in Grad School and I’m amazed how accurate a lot of the details in her book are. It’s nice to see this for people who have always wondered what it’s like in a Medical Examiner’s office. I’m currently reading my 2nd book called Postcards from France by Megan McNeill Libby but I would say my first read was the funniest. I read The Hating Game by Sally Thorne. Woohoo! I am LOVING this readathon so much. ❤ I started Fangirl by Rainbow Rowell today and I am really loving it. It's making me laugh and I can really identify with Cath. I’m currently listening to The Book of Life, the third book in the All Souls Trilogy. But I can’t stop thinking about Call Me by Your Name. I am enjoying The Snow Child by Eowyn Ivey this evening, an enchanting tale that will surely warm the winter night. Earlier today I started Stamped from the Beginning by Ibram X. Kendi which traces the roots of racism in the U.S. I’m thinking a copy should be issued to everyone. I’ve just started Slaughterhouse-Five – my very first Vonnegut! Ooo, I liked that one! I started with “Binti” and “Binti: Home” on audio, which was great since a) they’re fantastic books, and b) they’re only 2.5 and 4.5 hours long. Also, most of my family is out of town this weekend, which is faaaaaabulous! I’m bouncing between 3 books currently: The Heaven Tree by Edith Pargeter, the Beast is an Animal by Peternelle can Arsdale, and A Breath of Snow and Ashes by Diana Gabaldon…I find by doing this I break them up and keep it fresh…I have gotten sucked into The Heaven Tree something fierce though and think I may focus on just reading the trilogy for the Readathon! Has anyone read it?!? I’m reading An Echo In The Bone, Outlander book 7. It’s so looooong! I might have to switch it up soon! Mostly through “Heroine Complex” by Sarah Kuhn. Still pecking away at my bookclub selection, “The Luminaries” E Catton. I am almost done book three. I am reading The Force Doth Awaken. My answer is finishing Bury My Heart at Wounded Knee (first book 450+ pages, ALMOST DONE!) It felt right to revisit the sacred lives of the first residents of the United States that made American great in the vert first place. It is humbling and devastating to see the legacy of destruction that affected Native Americans and I would like to believe there is the history of learning from our past hatred, greed, and selfishness as a country. The Rise and Fall of Darth Vader was good. I wasn’t expected to see him differently other than being the bad guy in Star Wars. I was reading that this morning on my iPad until my library automatically returned it, and loaned it out to someone else!! How rude! It’s so good!!! Funny, one of the books in my stack for the readathon is called Leave Me Alone I Am Reading. I am currently reading Someday Someday !aybe by Lauren Graham and have been pleasantly surprised by the storyline. I’m about halfway through “Why I’m No Longer Talking to White People About Race” and I highly recommend it. I just finished Save Me The Waltz by Zelda Fitzgerald, which was even better than I expected! I loved it because it made me want to research and read more of the ‘Forgotten Generation’ ie., Scott Fitzgerald, Ernest Hemmingway, Edna St. Vincent Millay. Now, I’m moving onto Elizabeth Gaskell’s Mary Barton. She’s a great author! The funniest thing are some of the experiences Christoper Lee had during WWII as told in his autobiography “Lord of Misrule”. He had the most interesting life. Stephen King’s “Umney’s Last Case” had a great twist. Nothing sad in my stack this time. Finished As Bright As Heaven. It was very sad. I almost cried like 4 times. I’m currently reading Caraval, but I have finished Norwegian Wood, Smoke and Bone, and Bird of Paradise. I should be able to fit in one more, but I’m playing it by ear so I’m not sure what I’ll choose next. Currently reading an illustrated memoir called Tangles by Sarah Leavitt about caring for a mom who has Alzheimer’s. This could be the saddest. Also read The Last of the Whangdoodles purely because Julie Andrews wrote it and I love crazy titles. It had a great message about believing and using your imagination. That one was my most pleasant surprise. Lol my family and my devices are out to get me. My son has called me at 3 of the check in points to bring him something at the sleepover he is at. I think I deserve an award for not trying to beat him. My phone has failed twice while I have tried to submit , oh well I am still reading a lot. I am reading between 3 books. So, far I am loving Reboot. I love a good sci-fi and this one is great. Half way through Warcross and loving it! I’m reading If There’s No Tomorrow by Jennifer L Armentrout and I just got done crying because the feels are STRONG! I’m cozy in bed and getting ready to crack open ‘Cinder’ by Marissa Meyer! This is my first read-a-thon and I am loving it. My easy read was finished relatively quickly and I moved on to my classic. The Adventures of Tom Sawyer. It was interesting going through this as an adult since I haven’t read it since high school. I remembered many of the big scenes but completely forgot certain overarching aspects. Very different to read it now. I think Doctor Sleep surprised me the most. Besides being an 18 hour audio book, i didnt realize how complex the story would be. I kept thinking how did someone create this??!! But that King for ya! I’ve finished FIFTEEN hours of the readathon! I’ve finished half of John Green’s TURTLES ALL THE WAY DOWN (which I thought was going to be my first finish, but I abandoned it for half of MY GRANDMOTHER TOLD ME TO TELL YOU SHE’S SORRY, a re-read. Whoops. ), half of GRANDMOTHER, and all of Pete Souza’s photo-memoir of the Obama presidency. Reading a coffee table book was SUCH a great, unplanned idea! It really broke up the day and re-energized me! As far as pet peeves, it would have been nice to have my girls this weekend so they could ‘thon with me, and so they could housework for me (with my broken foot and all), but I’m managing on my own! It makes the reading that much more appreciated when I can sit and put my foot up! The Sound of Gravel. About halfway done and it’s so compelling. Currently reading (or should I say listening) to the audiobook of mockingjay. Its so much better than I ever thought it would be, can’t believe I havent already read it! I finished listening to the audiobook of Jessica Shattuck’s The Women in the Castle today, and it really was a remarkable book. I’ve read plenty of WWII-set novels, but this was far and away one of the best, with such empathy and real consideration for all the moral questions that come up in war time beyond the basic conflict itself. Highly recommended! Bouncing between: White Trash by Nancy Isenberg, Mountains Beyond Mountains by Tracy Kidder, Nightmares & Dreamscapes by Stephen King, and The life-changing magic of tidying up by Marie Kondo…. White Trash is by far the most demanding read. Many interesting historical points with lots of endnotes and references, not to mention words I have to look up (e.g. ouerve). Might’ve been a bit too challenging for #24in48, but I’m gonna keep pushing through!